Ishant Sharma's hostile spell in the morning session of the fourth and final day saw Delhi crush Vidarbha by 10 wickets to log home bonus points from their Ranji Trophy group leg encounter in New Delhi on Sunday. Ishant, who bowled frighteningly quick on a docile Kotla track, ended with match haul of 9-47 including 3-11 in the second innings to skittle Vidarbha out for 98. Needing 95 to win, Delhi knocked off the runs in 14.1 overs with Unmukt Chand hitting 51 off 41 balls, striking 9 fours and a six, while skipper Gautam Gambhir's 44 ball 45 had seven fours. Delhi now has 8 points from 2 games. In the morning, Vidarbha lost six wickets for 51 runs. 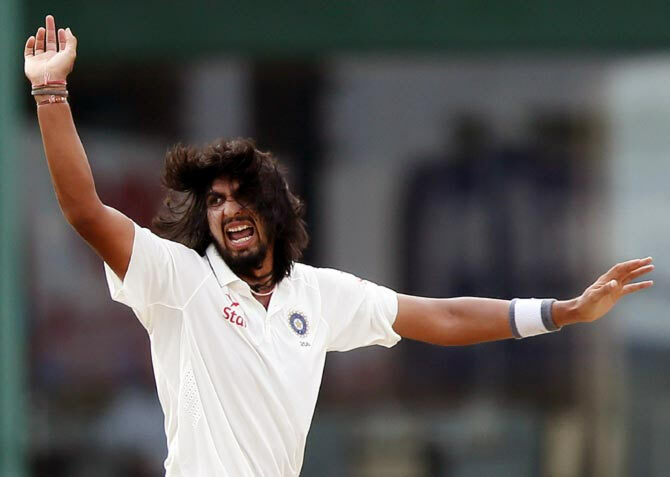 Ishant's second innings spell read 11-6-11-3 but figures alone won't tell the story. He was letting it rip. Ganesh Sathish played 73 balls for his 10 as he was hit on the helmet. He played and missed before Ishant got one to rise off length as Sathish gave catch at short leg. Ishant's best dismissal was that of Jitesh Sharma (9), when the batsman was squared and the bail clipped. In between, Pradeep Sangwan (3/30) and Manan Sharma (3/31) also got wickets. Earlier, the Delhi batsman also made it count when they managed 302 in response to Vidarbha's 298 in the first innings. Gambhir top-scored with a patient 96, while Nitish Rana (61) and lower-order batsmen Manan Sharma (53) as well as Sarang (42) made valuable contributions. In the next set of matches between October 15 and 18, Delhi will play Haryana, while Vidarbha will take on Karnataka. Delhi: 302 & (target 94) 96/0 in 14.1 overs (Unmukt Chand 51 no, Gautam Gambhir 45 no). Talented Punjab youngster Mandeep Singh notched up his second first class century in as many games but could not prevent his side from going down to hosts Mumbai by an innings and 12 runs in their Group B Ranji Trophy cricket match in Mumbai on Sunday. Part-time spinner Akhil Herwadkar starred for the hosts with an innings haul of 6 for 52, five of which he claimed on the day. Trailing Mumbai by 171 runs and commencing the final day at 244 for 4, Punjab's resistance ended in the second session for 403 in 127.2 overs at the Wankhede Stadium to provide the hosts with a much-needed outright win with a bonus point to boot. Mandeep Singh, needing 18 more runs at the start of the day to compile his 10th first class hundred in his 50th match, duly reached the landmark before he was dismissed for 116 (off 208 balls and inclusive of 13 boundaries), by Herwadkar. Gitansh Khera kept Punjab in the hunt with a breezy 86 in 117 balls that was laced with 9 fours and 3 sixes before he was ninth out to Herwadkar. Punjab batted much better than in the first innings when they were shot out for a meagre 154, but the huge lead of 415 that the conceded to Mumbai sealed their fate. Mumbai, who conceded the first innings lead to Andhra at Vizianagaram in their lung opener, bagged 7 points to take their tally to 8 while Punjab picked up none to add to the 7 claimed against Railways in their first game at home. Mumbai take on Tamil Nadu next at the BKC ground from October 15-18 while Punjab clash with Gujarat at home in Mohali on the same dates. Punjab: 154 and 403 all out (Jiwanjot Singh 91, Mandeep Singh 116, H Chawla 45, G Khera 86; A Herwadkar 6 for 52). Mumbai: 569 for 8 declared. Points: Mumbai 7, Punjab 0. Riding on a strokeful century by Arun Karthik and a 10-wicket match haul by Krishna Das, Assam thrashed Rajasthan by an innings and 152 to bag a bonus point from their Group A Ranji Trophy cricket match in Guwahati on Sunday. If Karthik's 151 laid the winning base for the hosts to post a mammoth 422 for nine declared in their first innings, then medium-pacer Krishna's five-wicket hauls in both the innings respectively sounded the death knell for Rajasthan. Getting behind a 236-run trail in the second innings, the Ashok Maneria-led Rajasthan were shot out for 84 on the fourth and final day as pace-spearhead Arup Das and Krishan bagged five wickets apiece. Krishna was deservedly the Man of the Match for his impressive bowling figures of 10-55 as the Gokul Sharma-led side pocketed 7 crucial points. Assam: 422/9 declared in 151 overs (K B Arun Karthik 151, Swarupam Purkayastha 50; K Ajay Singh 5-116). Rajasthan: 186 and 84 all out 28.4 overs (Ashok Menaria 20 batting; Arup Das 5-39, Krishna Das 5-23). Bengal captain Manoj Tiwary led from the front as his 20th first-class century ensured a point for the visitors against two-time defending champions Karnataka in a Ranji Trophy group league encounter, in Bengaluru on Sunday. Starting the day at 58 for two with another 167 runs to get in order to avoid innings defeat, Bengal reached 249 for four at tea when the two captains decided to call off the match. Tiwary, who failed in the first innings, scored a patient unbeaten 103 off 197 balls with 13 fours and proved to be an able guide for debutant Naved Ahmed (95), who missed well deserved hundred. The 29-year-old Naved consumed 248 balls and hit 16 boundaries. The Naved-Tiwary duo added 178 runs for the fourth wicket in 61.5 overs to ensure a drawn game. Brief Scores:Bengal 312 & 249/4 (Manoj Tuwary 103, Naved Ahmed 95). Karnataka 537/9 decl. Points: Karnataka 3 Bengal 1. Services earned three points by virtue of their first innings lead over Goa in a match that ended in a draw on the fourth and final day of their Ranji Trophy Group C match in Porvorim on Sunday. Services have now taken their tally to nine points from two games, while Goa, having gained just one point from this match, have four points in their kitty from two ties. Replying to Services' first innings total of 402, Goa resumed their innings at an overnight score of 268 for eight and added only another 17 runs. They were dismissed for 285 in 134.3 overs, conceding 118 runs first-innings lead. Shadab Jakati was first to get out on Sunday, caught by Shashank Sharma off PS Poonia's bowling after adding just two runs to his overnight score of 13. Poonia (5/60) then dismissed last batsman Rituraj Singh (21) to finish with an impressive five-wicket haul. Thereafter, Services declared their second innings on 217 for six after the first mandatory over was bowled. Soumik Chatterjee top scored with 64 runs. The home team, which needed 535 to win, was three for no loss when both the sides decided to call off the play. Services: 402 & 217 for six decl in 65.4 overs (Soumik Chatterjee 64, Yashpal Singh not out 59; Amit Yadav 3/40). Goa: 285 & three for no loss in six overs. Points: Services 3, Goa 1. Owing to their first innings lead, Maharashtra grabbed three crucial points against Odisha after their Ranji Trophy Group A match ended in a draw at the Barabati Stadium in Cuttack on Sunday. On the fourth and final day, Kedar Jadhav (100) cracked a superb hundred as Maharashtra declared their second innings at 289 for four in 92.1 overs after resuming from overnight score of 156 for 3. Chasing 304, Odisha scored 129 for five in 55 overs in their second innings. The hosts gathered one point from the match. Odisha: 267 & 129/5 in 55 overs (GG Rout 31; AA Sanklecha 2/11). Experienced campaigner Jalaj Saxena scored his 11th first class ton but the Madhya Pradesh middle and lower order failed as Tamil Nadu walked away with three points from the drawn Ranji Trophy match, in Indore on Sunday. Replying to the visitors' massive 596 for nine declared, Madhya Pradesh were all out for 407 despite openers putting on 213 for the first wicket. Starting at an overnight score of 181 for no loss, Saxena and his opening partner Aditya Shrivastava (90) batted for some time together before left-arM spinner denied the latter a century by trapping him. After that Saxena completed his hundred but could not last long and hosts batting line up crumbled. Only wicket- keeper batsman Naman Ojha (87) fought well but others fared poorly. Saxena's 124 came off 250 balls with 19 boundaries. Aswin Crist was the most successful bowler for Tamil Nadu, taking four for 88. Apart from the two openers and Ojha, the next best scorer for Madhya Pardesh was Udit Birla, who scored 18 off 31 balls. Madhya Pradesh: 1st innings 407 all out in 141.3 overs (J Saxena 124, A Shrivastava 90, N Ojha 87; A Crist 4/88, L Vignesh 2/81). Kerala bagged three points for taking the first-innings lead in their Ranji Trophy cricket match against Hyderabad in Hyderabad on Sunday. Besides Rohan Prem, who had scored a double hundred in Kerala's first innings, left-arm spinner Karaparambil Monish was the other star of the game as he returned a match haul of 11 wickets. At stumps on the fourth and final day, at the Rajiv Gandhi International Stadium, Hyderabad were 176 for seven in 77 overs. After putting up 401 all out in their first innings, Kerala bowled out the hosts for 218, with Monish returning impressive figures of six for 91. While opener Tanmay Agarwal top-scored with 64 in Hyderabad's second innings, the visiting side's Monish once again was the wrecker in chief, picking up five for 73 to finish with match haul of 11 wickets. Andhra collected three points on the back of their first innings lead as their Ranji Trophy Group B cricket match against Gujarat ended in a draw in Vizianagaram on Sunday. Andhra could not bowl out Gujarat in their second innings as the visitors ended at 254 for 4 in 90 overs on the fourth and final day to end the match in a draw. The home side, who had scored 421 all out in their first innings in reply to Gujarat's 308, ran away with three points on the basis of their 113-run first innings lead. Gujarat got one point. Resuming the day on 24 for 1, Gujarat were held together by four half-centuries. Opener Priyank Kirit Panchal added 109 with Bhargav Merai before he became Bodapati Sumanth's maiden first-class victim. Panchal was the next to fall when he was trapped lbw by Prasanth Kumar for 72 off 173 balls. Ruijul Bhatt and Parthiv Patel also hit fifties as Gujarat finished at 254 for 4 in 90 overs. Wicketkeeper-batsman Srikar Bharat, who scored 127 in the first innings, was named man of the match. Andhra: 421 (Srikar Bharat 127, Mohammad Kaif 76; Rush Kalaria 5/55) drew with Gujarat 308 (Parthiv Patel 122; D Siva Kumar 3/44) & 254 for 4 (Priyank Panchal 72, Bhargav Merai 54, Rujul Bhatt 50, Parthiv Patel 50). Riding on a superb bowling performance on the final day, Himachal Pradesh notched up a 10-wicket win over Jammu & Kashmir to bag seven points from their Ranji Trophy Group C match in Dharamsala on Sunday. Bipul Sharma (3/50) and Akash Vasisht (4/71) shared seven wickets as Himachal Pradesh shot out Jammu & Kashmir for 276 in their second innings, leaving the hosts with just 16 to get for an outright win. Ankush Bains (3) and Paras Dogra (4) then came out to complete the formalities at the Himachal Pradesh Cricket Association Stadium. Himachal Pradesh had scored 554 in their first innings, in reply to J&K's 293. Resuming at an overnight score of 85/1, SP Khajuria (73) and PA Sharma (43) continued to go strong for Jammu & Kashmir and added 77 runs before Vasisht broke the partnership, dismissing the first down batsman in the 65th over. Four overs later, Vasisht struck twice within a space of four balls to dismiss opener Khajuria and Rarvez Rasool (0) and reduce J&K to 177 for four in 68 overs. While Khajuria was caught and bowled, Rasool was cleaned up by Vasisht. J&K could not recover from the sudden lose of wickets as ID Singh was also clean bowled by Gangta. Next batsmen Bandeep Singh (3) and Adil Reshi (0) also were back in the pavilion with Vasisht being the destroyer on both occassion. R Dayal (28), Samad Bhat (17), M Mudhasir (15) and Umar Nazir (5) swung their arms around but it proved to be too little too late. Himachal Pradesh: 554 & 16/0 in 5 overs (P Dogra 4; Waseem Raza 0/1).